Each request has the baseline response time - it is the response time without load. Initially this value is set for each request during recording; you can re-calculate it after the test verification or manually modify it in request properties. 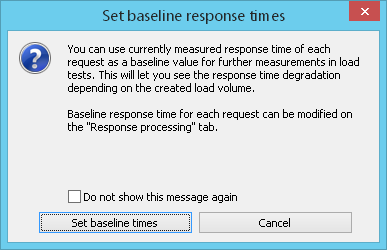 If you click the Set baseline times button in this dialog, then the currently measured values of response time for each request will be set as baseline values for load tests. This will let you see the response time degradation depending on the created load volume. WAPT Pro uses the values of baseline response time for calculation of performance degradation factor. Performance degradation factor is a ratio of the response time to the baseline time for each request. It shows how much the performance degraded under load. You can see the Response Time report and HTML report to check the performance degradation factor for individual requests and the whole profiles.